RO will call hits on Slug Gongs 1-6 Rifle Gongs 1-6, and Rifle Flashers 1-2. One hit to neutralize Rifle Gongs 1-6, Rifle Flasher 1-2 and Slug Gongs 1-6. 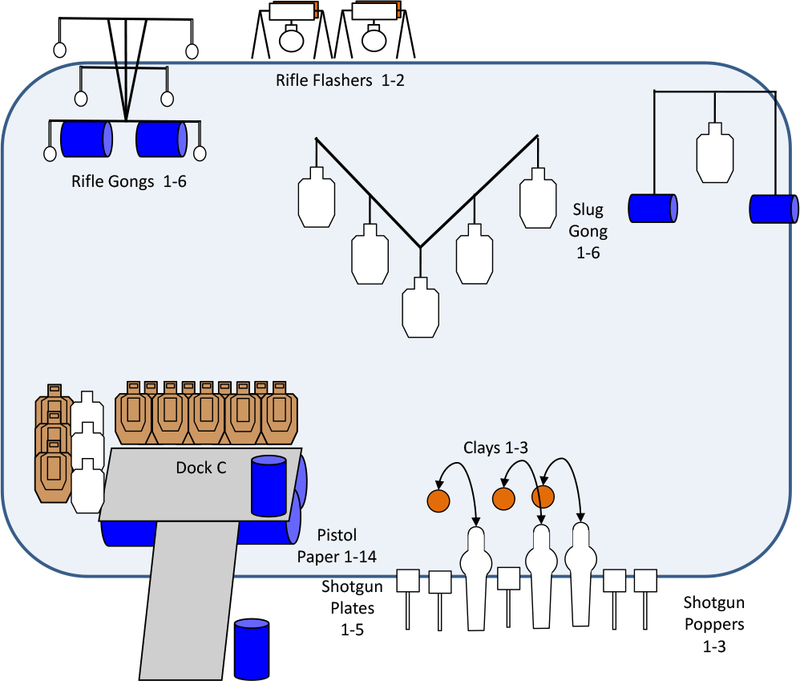 Upon start signal engage Rifle Gong 1-6 and Rifle Flasher 1-2. Ground safe rifle. Draw pistol and engage pistol paper 1-14 from walk way. Ground safe pistol. 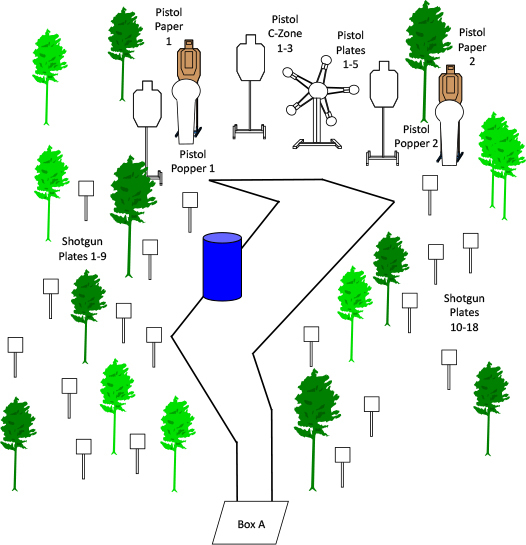 Retrieve shotgun and engage Shotgun Poppers 1-3, Clays 1-3, Plates 1-5,and Slug Gongs 1-6 with shotgun. Poppers1-3 activate Flying Clays 1-3. Standing in Box A Shotgun held in both hands. Pistol Loaded and Holstered. RO will call hits on C Zone Steel. 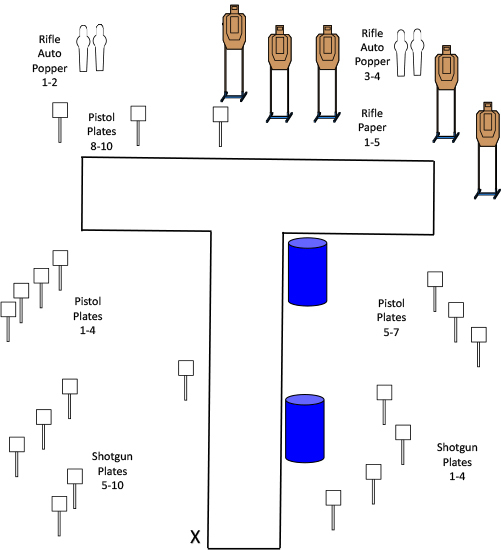 Upon start signal engage plates 1-18 with shotgun. Ground a safe shotgun in barrel. Draw pistol and engage 2Colt Poppers, Texas Star, 2 Paper, 3 C-Zone Steel. Standing with muzzle of shotgun touching mark. Shotgun plates are buckshot only. One procedural penalty will be assessed for each shot fired using birdshot. Upon start signal engage Plates 1-10 with shotgun. Ground a safe shotgun in barrel. 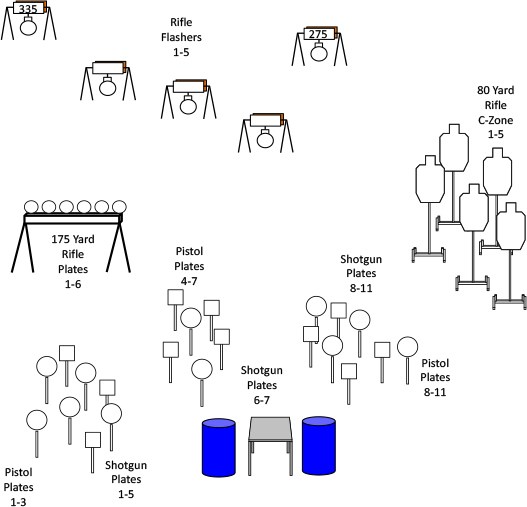 Draw pistol and engage Plates 1-10. Ground safe pistol.Load rifle and engage Auto Poppers 1-4 and Paper 1-4. 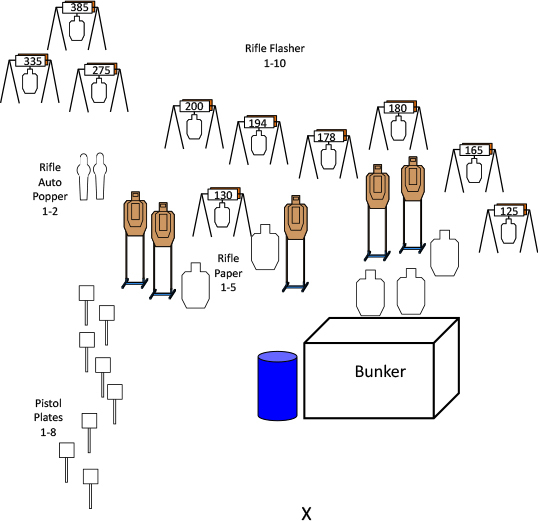 All rifle must be shot from within the bunker. 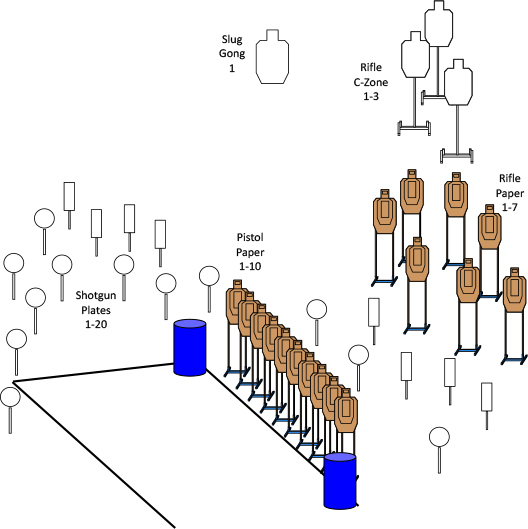 5 second procedural for each rifle shot fired while outside the bunker. Upon start signal draw pistol and engage pistol steel 1-8. Ground safe pistol.Retrieve rifle, enter bunker, and engage Rifle Paper 1-5, Rifle Auto Popper 1-2, Rifle Flasher 1-10. 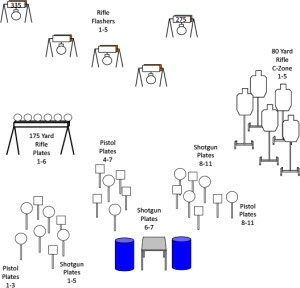 RO will call hits on Rifle Flash Targets 1-5 and Rifle C-Zone Targets 1-5. One hit per Rifle C-Zone to neutralize. 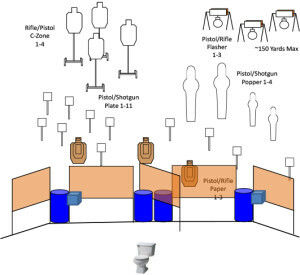 Upon engage draw or retrieve firearm and engage corresponding targets with appropriate firearm. 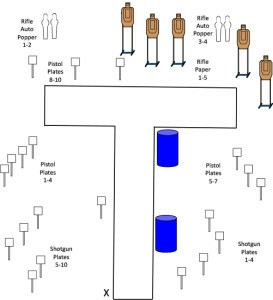 Shotgun Plates 1-11 are round plates.Pistol Plates 1-11 are square plates. Rifle and shotgun must be grounded in barrels. Seated on toilet, magazine in hands and knees on elbows. No belt may be worn with any ammo or loaders. RO will call hits on C-zone & Flash Targets. Two hits required on C-zone. One Hit required on Flash Targets. On start signal engage knockdown steel with either shotgun or pistol through the appropriate port. Engage paper, static steel (C zones) and flashers with either pistol or rifle. C zones require two hits per. Once a weapon is grounded it cannot be picked back up. Once a firearm is grounded it cannot be used again. If shotgun holds less than 9, loose rounds may be staged on barrel. 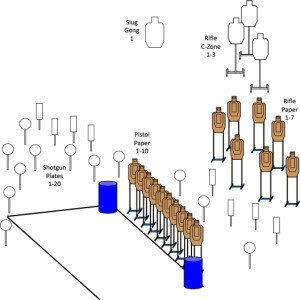 If rifle/pistol magazines or division capacity limit shooter to less than 15 rounds per magazine an additional magazine may be staged on barrel. Extra magazine may be staged in toilet tank with lid on unless above criteria are met. Standing with foot touching line w/loaded shotgun in both hands. RO will call hits on slug gong 1 & Rifle C-Zone 1-3. Rifle C-Zone 1-3 requires two hits each to neutralize. Upon start signal engage Shotgun Plates 1-20 and Slug Gong 1.Ground a safe shotgun. Drawpistol and engage Pistol Paper1-10. Ground a safe pistol. 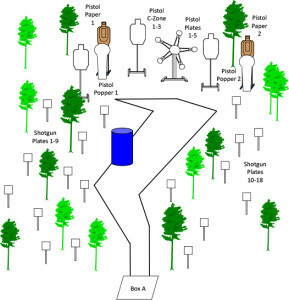 Retrieve rifle and engage Rifle Paper 1-7 and Rifle C-Zone 1-3. RO will call hits on Rifle Flasher 1-5 and Rifle C-Zone 1-4. 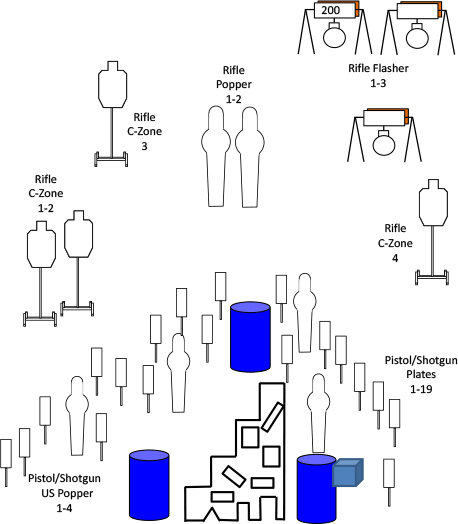 Upon start signal engage Rifle Poppers 1-2, Rifle C-Zone 1-4 and Rifle Flasher 1-5. Rifle poppers 1-2 must be engaged while touching the start line. 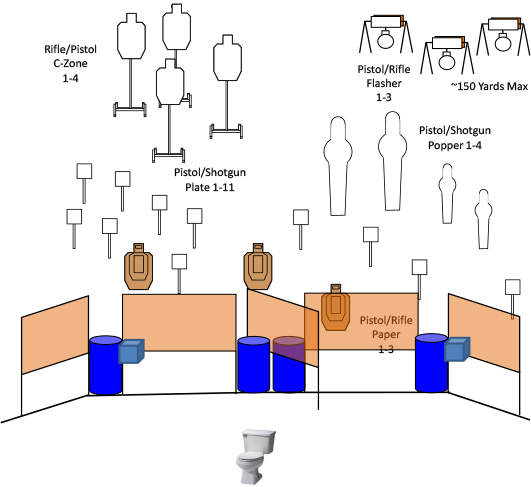 Ground safe rifle.Retrieve pistol/shotgun and engage Plates 1-19 and US Poppers 1-4 with either shotgun or pistol. Ground safe pistol/shotgun.